The name of Sipadan is simply legendary in diving circles, conjuring images of patrolling hammerhead sharks, millions of technicolored reef fish and, above all, dozens of sea turtles swimming peacefully everywhere. This description is not far from reality: it might even actually be down played a little as Sipadan is considered one of the five top diving destinations in the world. This small rainforest-covered tropical island rising from a 700 meter abyss in the Celebes Sea is a destination the committed diver cannot miss. Sipadan used to have resorts but to protect the environment these were closed around the year 2002. To dive on Sipadan you have to stay somewhere nearby, such as on Mabul or in Semporna, and take a boat onto the island. Because Sipadan is now a protected site, only 120 dives are allowed daily (as of 8/26/08). It's best to try to dive as early as possible to beat the crowds and increase your chances of getting on the roster to dive. From the main beach of the original resort it is a mere 20m wade over the reef to reach the top of the reef wall dropping 1000-2000m. Sipadan is surrounded by very rich reef life consisting of both hard and soft coral as well as all manner of reef fish. Sea turtles and white tip reef sharks can be seen on almost every dive and hammerhead and leopard sharks can also be seen at times. Visibility ranges from 10m to 30m and above. Note that a barge accident on 15 May 2006 did some damage to the reefs at Sipadan, crushing a portion of reef on the old pier and Barracuda Point and dumping its cargo of gravel in the area. This was not one of the best dive areas, but cleanup operations and other repercussions did restrict diving in the months since. The rate for three dives at Sipadan is around RM560. Rates vary slightly among different operators. Boat transfers and packed lunch are included. Permits are limited to 120 per day and are typically obtained by the dive operators. You should verify that the diver operator you choose is diving at Sipadan with permits, as some companies have been caught diving the island recently without permits. 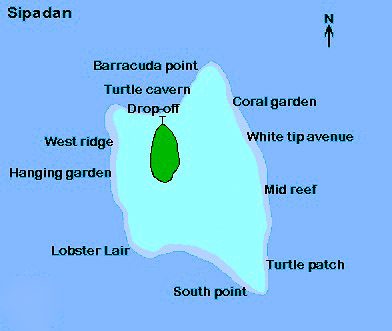 Some of the most famous dive sites are the Barracuda Point, where you'll be able to see thousands of barracudas whirling around, The White Tip Avenue, where white tips rest in this slopy area, and The Turtle Cave and Turtle Tomb, dive sites restricted to Cave divers only, where one can see turtle skeletons. Sipadan Island lies off the east coast of Malaysian Borneo. The island is known above all for some of the best scuba diving anywhere in the world. Because of its strategic location, the islands were previously disputed between Malaysia and Indonesia, leading to instability and a highly publicized case of 20 tourists being kidnapped by Abu Sayyaf rebels in 2000. However, an International Court of Justice decision sided with Malaysia. Because of this, and some pirate activity in the area some years ago, the area remains regularly patrolled by the Malaysian navy.